As a mom, I spend a lot of the holiday thinking about what to get everyone else for Christmas. From the kids to cousins to grandparents, there can be a lot of people! In year’s past, I have been guilty of forgetting even toddlers love the feeling of giving a present to someone. There’s an immeasurable joy little ones feel in sharing a part of themselves during the holidays through gifts. However, most toddlers and preschoolers are not interested in store-bought items. They understand that gifts from the heart are what matter. As adults, I think we sometimes forget that gifts also don’t have to be elaborate or fancy. This Christmas, take the time to slow down and create an easy homemade holiday card that children will feel pride in giving and family members will cherish. 1. Gather up any craft materials you have in the house: construction paper, crayons, glitter, yarn, glue, etc. 2. Ask your child to draw/create a picture of their family. If it’s for their grandparents, ask your child to draw a favorite outing. If it’s for their cousins, perhaps it’s a picture of the kids playing a game or sport. Or even ask your child to draw what they love about that person. 3. You can have your child keep the drawing simple or add in embellishments using yarn, stickers, glitter and what not. 4. When your child is done, ask her to tell you about the picture and write down what she says on the back. Sometimes, what they say can be pretty hysterical! 5. You can modify this by folding construction paper in half and having them make their own Christmas cards, too. Although this may seem like such a simple gift, people are always touched by the sentiment. And it’s important to teach children early the joy of giving someone else a gift. You can never start too soon! Plus, despite the craziness of the season, you can easily find the time to help your child create this present. So this year try to take the time to make a gift with your children. 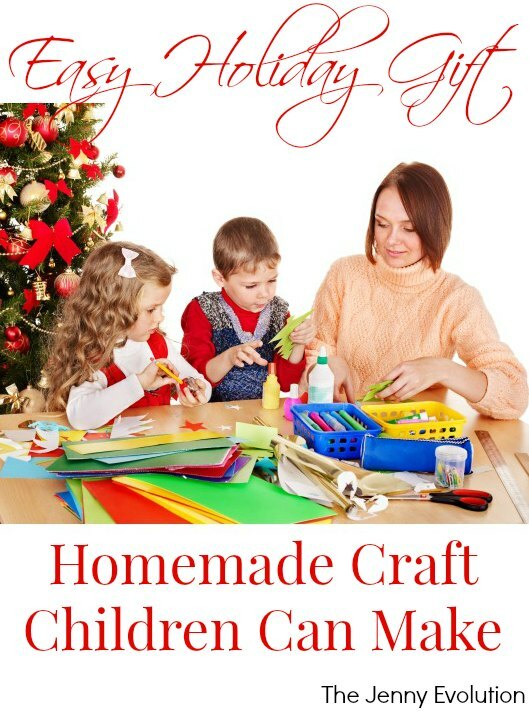 Not only will you and your children love the quality time you’ll be spending together, but you’ll also be helping them make their own Christmas presents to give away!